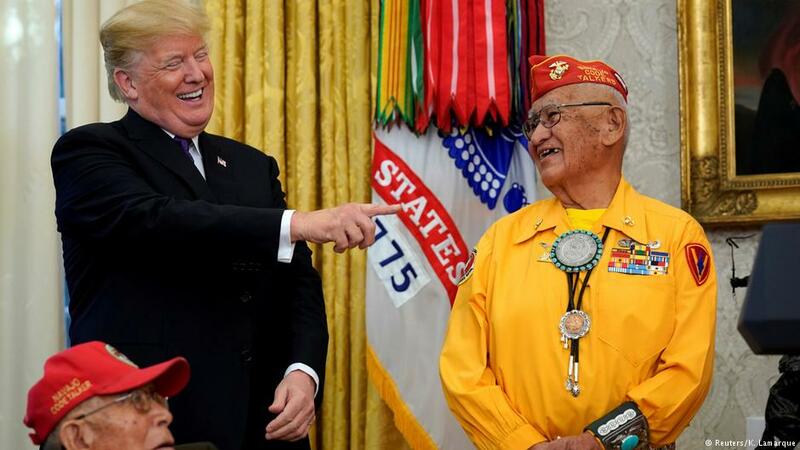 Insulting Democrat politician Elizabeth Warren, Donald Trump throws a Twitter jab invoking racism and mass killing of Native Americans. Warren formally declared her candidacy for the 2020 Presidential race on Friday. She promoted an increase in the minimum wage, Medicare for All, support of diversity and immigration, and advances in women’s and workers’ rights. “This is the fight of our lives. The fight to build an America where dreams are possible, an America that works for everyone,” the US Senator from Massachusetts said. Rather than responding to Warren’s policies or record, Trump — with a long history of deriding her — Trump tweeted about her claim to Native American ancestry. Amid forced relocations of Native Americans, Chickasaw, Choctaw, Creek, Seminole, and Cherokee people were moved from the southeast US on the “Trail of Tears” between 1830 and 1850. Thousands died on the journey — in the Cherokee removal of 1838, prompted by the discovery of gold in northern Georgia, between 2,000 and 8,000 of 16,543 perished. Trump Jr. also circulated a post that joked about “Native American genocide” which “continues with another murder by the President”. Last month he tweeted, after Warren informally launched her candidacy with a home video, that she should have filmed it at Wounded Knee in South Dakota, the site of an 1890 massacre of hundreds of unarmed Native Americans by US troops. Trump’s insult was part of a day of 14 tweets and retweets, many of them betraying concern over the Democrat challenge in 2020 — and of the Trump-Russia investigation that might prevent him standing for re-election. In a bizarre end to the day, Trump — a climate change denier — portrayed Democrat proposals on the environment as an abolition of services, utilities, and even cattle.